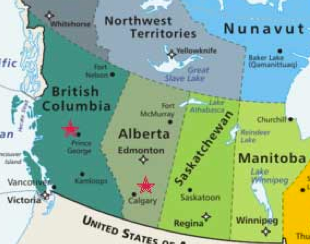 Launched in 2014, EVA BC has been part of a 2-year collaborative project between British Columbia, Alberta, Saskatchewan and Manitoba to ensure consistent and improved responses to sexual assault across the four western provinces. While each province has addressed its own priorities, all developed resources are being shared among the group. Funding for this project is provided by Status of Women Canada. A gender-based needs assessment was conducted in the project’s first year to identify needs and gaps around responding to sexual assault. Focus groups were conducted with women who had experienced sexual assault and anti-violence service providers responded to an online survey. The analysis focused on factors that either enabled or were barriers to disclosure of sexual assault, positive and negative service responses, the specific service barriers faced by vulnerable groups of women, and promising practices for working with victims/survivors of sexual assault. 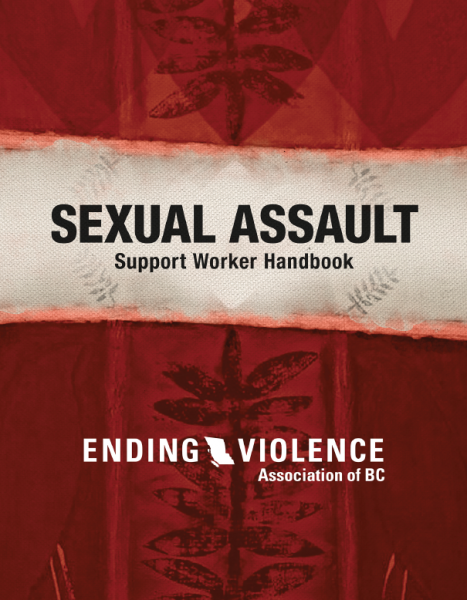 An update of the Sexual Assault Support Worker Handbook, last revised in 2007, was developed in the project’s second year. Updates reflect changes in policy, legislation and best practices. It also integrates recent developments in the understanding of the dynamics and impacts of sexual assault and how to best respond to sexual violence. Sexual assault disclosure response practice tips tailored to various sectors are another new resource resulting from this project. EVA BC’s goal in sharing best practices with responders from different sectors is to improve the response of every system for sexual assault survivors as they navigate through a variety of systems. 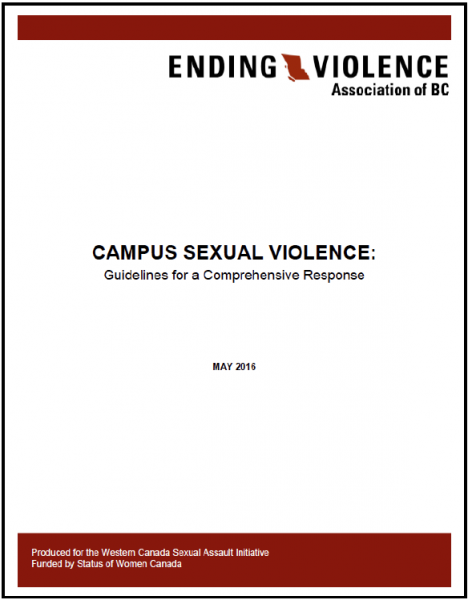 Campus Sexual Violence: Guidelines for a Comprehensive Response were developed to support university and college campus communities in their response to sexual violence. The guidelines assist in the development and revision of policies and protocols, and outline various disclosure and reporting options, services, and accommodations that may be available to survivors. They also provide guidance around confidentiality and information sharing and highlight the critical components of campus sexual assault training and education. 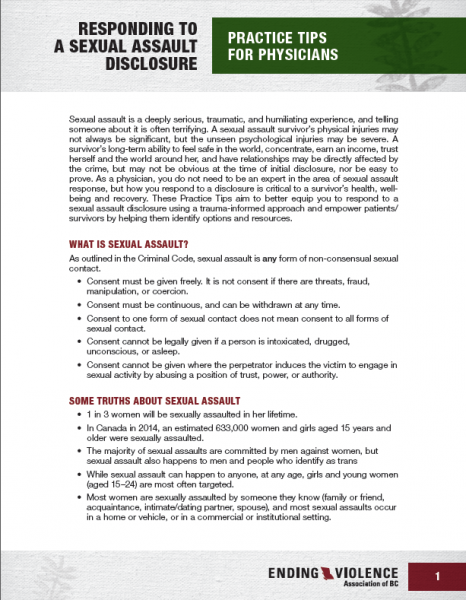 This one-page Overview of Guidelines provides an at a glance summary of the 10 guidelines developed to support university and college campus communities in their response to campus sexual violence. Available in several languages, I Have Been Sexually Assaulted, What Do I Do? is an informational pamphlet for women who have been sexually assaulted. Members of EVA BC’s Advisory Committee for this project are regional representatives from front-line service agencies in Kelowna, Kitimat, Prince George, Surrey and Victoria. The Ending Violence Association of Canada (EVA CAN) was formed in response to the need to foster a national voice. It grew from the partnerships and discussion brought about through the Western Canada Sexual Assault Initiative. EVA CAN’s purpose is to bring together all of the sectors involved in the array of anti-violence issues for national dialogue and action, for collaboration across provinces and territories to develop comprehensive and coordinated responses, for developing and sharing information and best practices, promoting safety of workers in the field, and creating more effective gateways to services.